The Internet of Things (IoT) is making waves in a wide variety of areas, whether it’s manufacturing smart products, building connected cars, or even allowing us to remotely control appliances in our homes. As IoT technology makes its way into shipping, what impact could it have on established practices? Monitoring fuel consumption: Compliance with strict environmental protection regulations is one of the biggest drivers in shipping right now. This is reflected in Inmarsat’s findings: 65% of respondents are already either using or trialing IoT-based fuel consumption monitoring. This figure is set to reach 100% by 2023. To Ship operators will increasingly rely on smart monitoring systems to gather data on fuel consumption and store it in the cloud. SKF BlueMon is one example of a system that could pave the way to IoT-based fuel consumption monitoring. 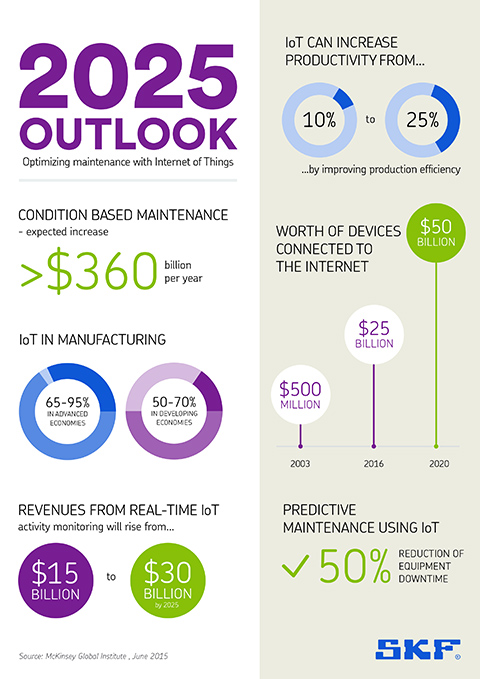 Reducing risk and cost of maintenance: The IoT has the potential to support engineers and crewmembers with routine maintenance tasks. IoT devices could for example monitor machinery to provide early warnings of breakdowns and even identify hazardous areas around damaged parts to reduce risk to crewmembers. This condition-based maintenance approach could benefit greatly from IoT connectivity as data is shared simply and securely between ships and land-based experts. Optimizing routes: Networking ships with the IoT makes it possible to improve communication between vessels. Real-time location tracking enhances the ability to determine the most efficient routes and avoid collisions with less chance of user error compared to radio communication. Increasing supply chain visibility: IoT-based technology will allow supply chain members to track container consignments with greater precision. On a smaller scale, sensors can even be used to monitor metrics such as the temperature inside containers to ensure goods arrive in top condition. Alerts could prevent cargo damage and losses, without the need for regular inspections. There is still some work to be done before IoT technology becomes truly widespread in the maritime sector. For example, there are numerous cybersecurity concerns: inadequate network security, insecure data storage, and data protection compliance requirements are all obstacles that will need to be overcome. Moreover, according to Inmarsat’s research, 42% of organizations believe they would benefit from additional IoT skills. The top three areas for improvement are decision making, security, and technical skills. If the industry can overcome this skills gap, then maritime companies of all kinds could expect to reap the benefits of the Internet of Things in the near future.